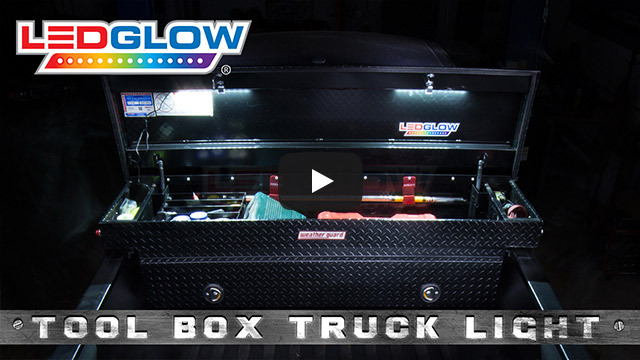 LEDGlow's 2pc Truck Tool Box LED Lighting Kit features two 12" SMD LED light tubes that install to the top of the tool box lid and offers an ultra-bright white LED and hands-free illumination! Having a tough time finding some tools in your truck’s tool box when working after dark? It’s time to ditch the flashlight and let LEDGlow take over! 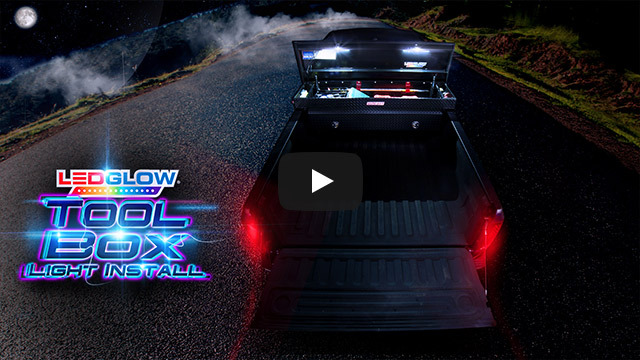 LEDGlow’s 2pc Truck Tool Box LED Lights feature (2) 12” LED light tubes that install on the underside of the top lid of the tool box offering ultra-bright white LED lighting and hands-free illumination. Each 12” LED light tube features 12 surface-mounted white LEDs which have been designed with 90 degree angled illumination that shines directly into the tool box. This makes it extremely easy to locate anything you’re looking for - whether you’re working late at the construction site or even in your driveway at home. This kit includes two different power switch options - a magnetic switch and an on/off toggle switch. The magnetic switch allows you to power your tool box lights on by simply opening up your tool box lid. When you’re done using the tool box, close the lid and the magnetic switch automatically turns the lights off. Alternatively, you can use the on/off toggle switch allowing you to power your truck’s tool box lights from inside the cab. Installing the two 12” LED light tubes is a breeze with the pre-attached double sided 3M™ tape which adheres the back of the light bars directly to the tool box lid. Each tool box light kit comes included with 20’ of wiring to run the power and ground wires to the battery, as well as wire ties and wire tie mounts to secure any excess wiring. LEDGlow includes all necessary mounting hardware, installation instructions, free lifetime technical support and a one year limited warranty with every lighting kit purchased. Very pleased with the kit. It provided everything needed to install. I added the expandable circuit and that made connecting to power a breeze. Install took me about an hour after routing and zip tying my cord up. The lights are super bright, they don’t just light of my tool box but they get the whole bed of the truck. I’ve recieved several compliments from guys on the job. The lights use 3M tape but give an option to be screwed down and I really like that. Overall I’m very happy with the product. Easy to hook up, everything you need is there and the lights are super bright. Very impressed. Very happy with my purchase. Lights are nice and bright, and easy to install!! This was an easy install. Wish I had found these guys years ago. The lights are very bright and work flawlessly when I open and close my toolbox lid. Thank you for a great product. The screw mounting tabs were broken off in the packaging, they are fragile and just part of the messy super-glued end caps. Should have an under-hood rated fuseholder and much larger wire terminals for such an application, instead of the small glass fuse holder; who uses glass fuses anymore? Put in an ATC or ATM fuse common for automotive application. Also, magnetic switch needs to be in close proximity of about 1 inch to work, I would like to see it be greater than that; very hard to set that up on my Weatherguard 13 tool chest.